Increase productivity and save time by using LinkedIn Recruiter to search for candidates across multiple regions at the same time. In a recent LinkedIn group discussion, I read about a recruiter's frustration with how time-consuming searching by Zip Code can be when looking for candidates in multiple locations. While searching by postal code is great when you want to pinpoint results to a specific location, there has to be a more convenient way to search in multiple locations at the same time. I am happy to tell you that you can do this today using LinkedIn Recruiter. 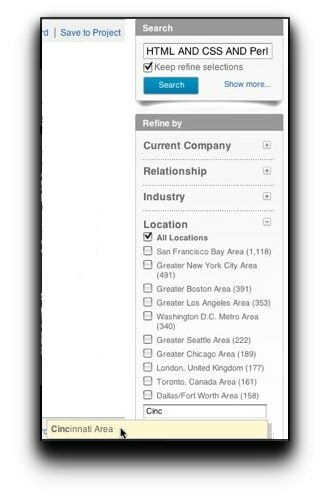 Instead of defining a location using a postal code, select only the country, or the default option of Anywhere. 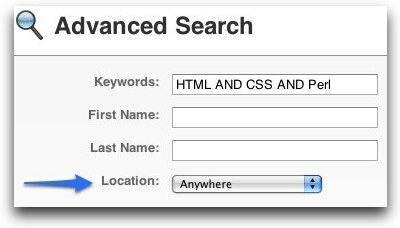 Sure, your results will include possibly thousands of matching profiles, but now you can easily zero in on a subset of geographically desirable profiles using LinkedIn's Advanced Search Dynamic Refinement Filters. By default the top 5 locations are listed and clicking Show more . . .will reveal the top 10. If your desired location isn't listed, start typing the state or city or country name in the textbox and if it appears on the drop-down list, select it and it will be added. The number of matching profiles in each location is listed in parenthesis and checking the boxes will dynamically filter your results to show only profiles from the location or locations checked. Now you have a set of results which includes potential candidates who not only have the skills, qualifications and experience to fill the position, but are located in all the places that matter. Don't forget to save this search!